We are located in the mountainous terrain on the island of Cyprus in Europe, down the Mediterranean. Cyprus is a cross point of three continents, Europe, Asia and Africa. 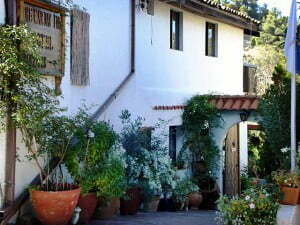 The Marjay Inn is situated in the small village of Spilia, which is located in the Troodos Mountains, 1100M high. If you approach the village from Nicosia you pass the village of Kakopetria and driving further for 3 klm, you will see the sign to Spilia village. Take this turning towards Spilia and follow this road in the forest. You will reach the vilage after 4 klm. If you approach from Limassol, you will turn right after the village of Trimiklini and you will drive towards the village of Kato Amiandos. Passing this village and up to the main Troodos – Nicosia road, you will turn right towards Spilia. You will find our hotel in the middle of the village, just after the series of bronze statues on your right hand side. You will recognize us from our characteristic entrance.